Need a super simple project to do with the kids? 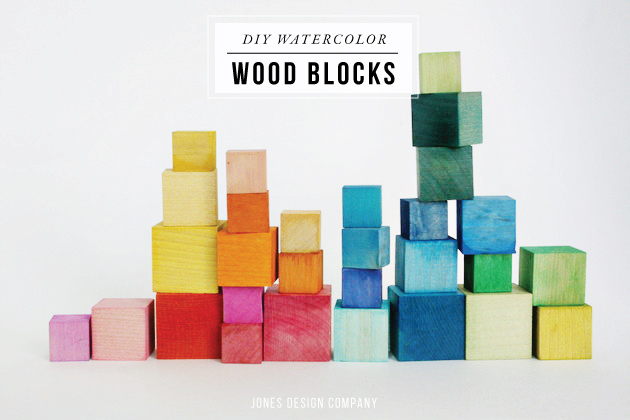 This watercolor wood block project is perfect. It’s also great for an unexpected baby gift or fun party decorations for a birthday party or baby shower or thrown in a bowl for chic accessory on your coffee table. Multi-use diy’s that are inexpensive and simple to execute are my favorite. When you’re done coloring, you will have so much fun playing with the blocks – arranging by color, stacking and sorting. This one might look like it’s for the kids, but believe me, these blocks are for grown ups too. They really do look pretty in a bowl (and make for an interactive coffee table accessory!). Or of course, use them for actual play things. Keep in mind that if you are using these for babies, make sure you seal in the color with a spray sealant (or several layers of mod podge). Just for fun, I created this color-mixing chart. It’s fun to try out different combinations of liquid watercolors to get as many pretty hues as you like. Love these! But is the Mod Podge non-toxic? I worry about baby chewing on The Mod Podge. Could you make these with food colouring somehow for a more natural dye process? I’m not sure about that. You may want to look into a different sealer that is safe for babies mouths! love these! now i just have to find a reason to make them!